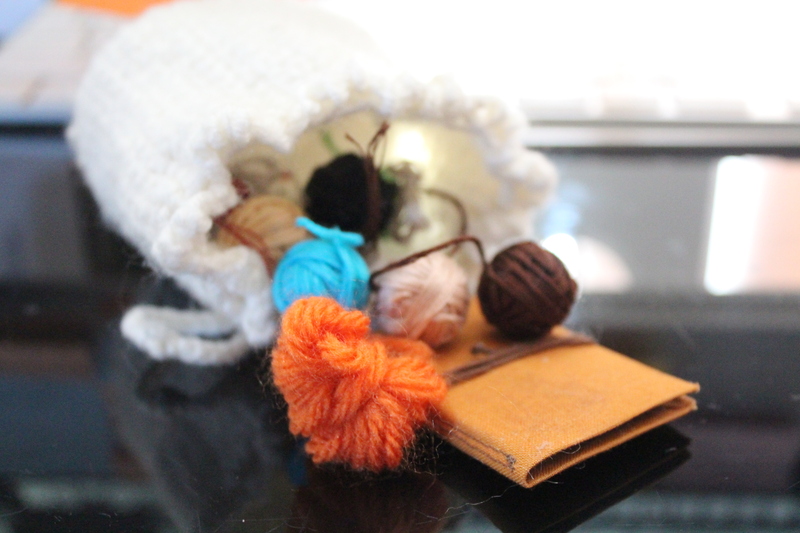 As promised, pictures of the contents of Reyna’s sewing kit. I just sort of dumped it out and snapped the first one. Which turned out to be a pretty nice photograph. The bag itself is knitted using the linen stitch, which you can google as you please to learn how to do it. I’ve said it before and I’ll say it again: I think this knitting stitch looks much better for medieval applications than regular knit and purl lines, or crochet. The little balls of thread are simply embroidery floss in multiple colors, picked partially at random and partially using colors I know people I know well will be wearing and thus might actually come in handy. Along with a hank of random yarn that may or may not be handy but totally seemed sensible to throw in there. The little gold-colored book is a needle book. It was made using a playing card I’d cut in half (from a cheap dollar store deck I’ve got for making weaving cards from. You’ll hear more about this later. Rest assured I didn’t ruin a card that was worth doing anything else for. The ink is already flaking on it, and it’s never been used). The book is bound using plain Kona Cotton that’s been glued to the card. There’s about a quarter inch gap between the front and back covers on the fabric, which is where the pages (two rectangles of brown flannel. They’re scraps from the corset I made and You’ll see later, since I’m still working finishing touches on that). The needles are an assortment selected at random (though with a mind towards what might be handiest) and just stuck in the book. There’s also a page with a half-dozen or so pins on it, that’s not shown. The closure is just a hank of embroidery thread with knots in it. There are no scissors yet, due to the fact that I haven’t found a small enough set that also looks medieval. Amongst the odds and ends I’ll be adding thread winders (as described by various ladies of the SCA), though those might wait until I’m putting together the full needle-craft basket that will include my knitting and things like that that I might wish to have wish during events. It is, IMO, things like this that “finish” a character. A practical individual like Reyna, who is also a bit of a clothes-horse, would simply be able to whip out a needle and thread and fix the problem if something should be damaged. Layers and details are important. This is one of those.